A habitable zone (HZ) in astronomy is a region of space where conditions are best for life to form as on Earth. Planets in these areas are the most likely to have extraterrestrial life. The habitable zone may also be called the "life zone", "comfort zone", "green belt" or "Goldilocks zone". One in five stars has an Earth-sized planet in the habitable zone. However, it is not known what proportion would have conditions suitable for life. The Goldilocks principle or 'Goldilocks effect' is that something must be within limits: "not too hot, not too cold, but just right". It is taken from a children's story "The Three Bears" in which a little girl named Goldilocks finds a house owned by three bears. Each bear has their own preference of food, beds, etc. After testing each of the three items, Goldilocks determines that one of them is always too much in one extreme (too hot, too large, etc. ), one is too much in the opposite extreme (too cold, too small, etc. ), and one is "just right". 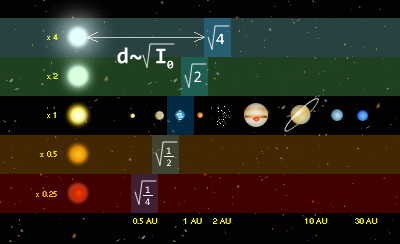 In astrobiology, the Goldilocks zone refers to the habitable zone around a star. A planet must neither be too far away from, nor too close to a star and galactic centre to support life. Either extreme would prevent a planet evolving life. Such a planet is colloquially called a "Goldilocks planet". In a solar system, astronomers believe a planet must be in the habitable zone to have life. The circumstellar habitable zone is an area around a star where a planet would be able to have liquid water. Liquid water may be necessary for all forms of life. Bigger stars are generally hotter, so the circumstellar habitable zone would be farther away from the star than for the Sun. Smaller stars are cooler, so the circumstellar habitable zone would be closer to the star than for the Sun. The size and brightness of a star determine where the circumstellar habitable zone is found around the star. Earth Similarity Index (ESI) — Similarity to Earth on a scale from 0 to 1, with 1 being the most Earth-like. ESI depends on the planet's radius, density, escape velocity, and surface temperature. Standard Primary Habitability (SPH) — Suitability for vegetation on a scale from 0 to 1, with 1 being best-suited for growth. SPH depends on surface temperature (and relative humidity if known). Habitable Zone Distance (HZD) — Distance from the center of the star's habitable zone, scaled so that –1 represents the inner edge of the zone, and +1 represents the outer edge. HZD depends on the star's luminosity and temperature and the size of the planet's orbit. Habitable Zone Composition (HZC) — Measure of bulk composition, where values close to zero are likely iron–rock–water mixtures. Values below –1 represent bodies likely composed mainly of iron, and values greater than +1 represent bodies likely composed mainly of gas. HZC depends on the planet's mass and radius. Habitable Zone Atmosphere (HZA) — Potential for the planet to hold a habitable atmosphere, where values below –1 represent bodies likely with little or no atmosphere, and values above +1 represent bodies likely with thick hydrogen atmospheres (e.g. gas giants). Values between –1 and +1 are more likely to have atmospheres suitable for life, though zero is not necessarily ideal. HZA depends on the planet's mass, radius, orbit size, and the star's luminosity. Planetary Class (pClass) — Classifies objects based on thermal zone (hot, warm, or cold, where warm is in the habitable zone) and mass (asteroidan, mercurian, subterran, terran, superterran, neptunian, and jovian). Habitable Class (hClass) — Classifies habitable planets based on temperature: very cold (< −50 °C); cold; mesoplanets (M) = medium-temperature (0–50 °C); thermoplanets = hot; very hot (> 100 °C). Mesoplanets would be ideal for complex life, whereas class hP or hT would only support extremophilic life. Non-habitable planets are simply given the class NH. This concept is not so widely used. It is the idea that a solar system must also be in a suitable place inside a galaxy for life to form. Some areas of galaxies are better suited to life than others. The Solar System in which we live, in the Orion Spur, on the Milky Way galaxy's edge is a life-favorable spot, since we are there. It is not in a globular cluster where immense star densities are inimical to life, given excessive radiation and gravitational disturbance. Globular clusters are also primarily composed of older, probably metal-poor, stars. Furthermore, in globular clusters, the great ages of the stars would mean a large amount of stellar evolution by the host or other nearby stars, which due to their proximity may cause extreme harm to life on any planets, provided that they can form. It is not near an active gamma ray source. It is not near the galactic center where once again star densities increase the likelihood of ionizing radiation (e.g., from magnetars and supernovae). A supermassive black hole is also believed to lie at the middle of the galaxy which might prove a danger to any nearby bodies. The circular orbit of the Sun around the galactic center keeps it out of the way of the galaxy's spiral arms where intense radiation and gravitation may again lead to disruption. The habitable zone is the region around a star where a planet has sufficient atmospheric pressure to keep liquid water on its surface. A habitable planet candidate implies a terrestrial planet within the zone, and with conditions roughly comparable to those of the Earth (i.e. an Earth analog) and thus potentially favourable to life. Only about a dozen planets have been confirmed in the habitable zone, but the Kepler spacecraft has identified a further 54 candidates. Estimates suggest that there are "at least 500 million" such planets in the Milky Way. The table can be sorted by clicking the up or down arrows. ↑ Muir, Hazel (2007). "'Goldilocks' planet may be just right for life". New Scientist. Retrieved 2009-04-02. ↑ "The Goldilocks Planet". BBC Radio 4. 31 August 2005. Retrieved 2009-04-02. ↑ Mullen, Leslie (2001). "Galactic habitable zones". Astrobiology Magazine. Retrieved 2007-08-05. ↑ "The Goldilocks Zone". NASA. 2003. ↑ Borenstein, Seth (2011). "Cosmic census finds crowd of planets in our galaxy". Associated Press. ↑ Vogt, Steven S. et al (2010). "The Lick-Carnegie exoplanet survey: A 3.1 M_Earth planet in the habitable zone of the nearby M3V star Gliese 581". arXiv:1009.5733 [astro-ph.EP]. ↑ Chow, Denise (2012). "Newfound alien planet is best candidate yet to support life, scientists say". Space.com. ↑ Kaltenegger, L.; Udry, S.; Pepe, F. (2011). A Habitable Planet around HD 85512?. ↑ Rogers, L.A.; Seager, S. (2009). "Three possible origins for the gas layer on GJ 1214b" (abstract). The Astrophysical Journal 716 (2): 1208. doi:10.1088/0004-637X/716/2/1208. ↑ Sample, Ian (7 November 2007). "Could this be Earth's near twin? Introducing planet 55 Cancri f". London: The Guardian. ↑ "NASA's Kepler confirms its first planet in habitable zone of Sun-like star". NASA Press Release. 2011. ↑ "BBC News - Kepler 22-b: Earth-like planet confirmed". BBC Online. 2011. Retrieved 6 December 2011. ↑ "NASA - NASA's Kepler discovers multiple planets orbiting a pair of stars". ↑ Wang, Ji (2013). "Planet Hunters. V. A confirmed Jupiter-size planet in the habitable zone and 42 planet candidates from the Kepler archive data". arXiv:1301.0644v1 [astro-ph]. This page was last changed on 26 October 2018, at 06:24.